In case you missed it, you should know that the British pound (GBP) caused ruckus in the forex markets during the early Asian session when it unexpectedly and dramatically dropped against its major counterparts. We’re talking about hundreds of pips in minutes, yo! It was a “fat finger” incident. The flash crash could very well be the fault of a single trader who simply entered the wrong buttons (i.e. extra zeros) while entering a trade order. Believe it or not, it’s not that uncommon in the forex scene. Wrong keys or not, the move couldn’t have happened at a more efficient time to maximize its impact. London is asleep, New York has just closed shop, Tokyo traders are just warming up, and Hong Kong and Singapore’s markets have yet to open. 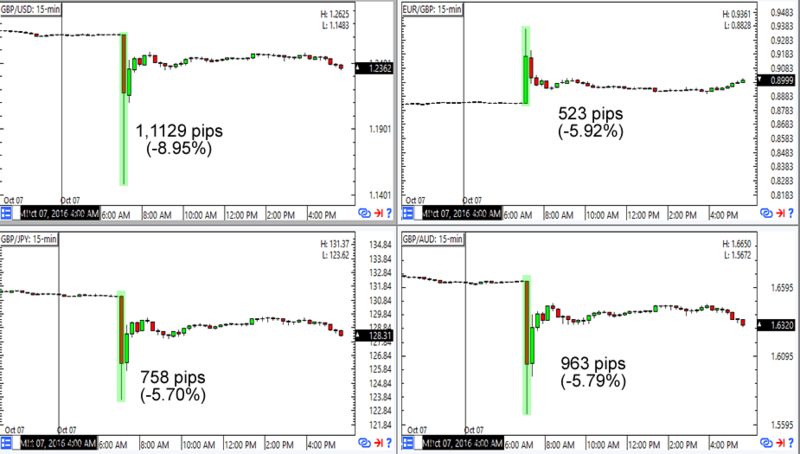 It’s literally the most illiquid period of a regular forex day! For trading newbies out there, think of it as the seller lowering his/her prices until he/she finds a buyer (difficult in an illiquid market) who is willing to match his/her price. Forex traders went all Jamie Foxx on the markets and blamed it on the a-a-a-a-a-algos. You know, those lightning-fast robots that use algorithms to enter trades? Analysts point out that algos could have picked up the fat finger move and extended it with their follow-up orders. He also added that “There must be a threat, there must be a risk, there must be a price. Otherwise we will be in a negotiation that cannot end well.” The prospect of major EU players like France making it economically painful for the U.K. to leave the political block doesn’t bode well for the Brexit team’s plan to get favorable business deals from the exit. So, was it really one factor or another that caused the crash? I don’t think so. It’s more likely the combination of a fat finger incident getting picked up by algos, and then exacerbated by illiquid markets and traders not feeling the love for the pound these days. Talk about a perfect crime! The kind that would keep BOE Governor Mark Carney in painkillers for the whole day. After all, even though a weak currency would boost the U.K.’s exports, I doubt that the BOE would want to have one in the context of market fear and uncertainty. The pound fell to as low as 1.1485 against the dollar, a low not seen since March 1985. That’s three DECADES, people! EUR/GBP also hit a seven-year high of .9359 before settling back to sub .9000 levels, while GBP/JPY also fell by 226 pips from its open price before seeing some buyers. Oh, and have I mentioned that all these drops happened in 2-3 minutes? The uncertainty over the crash spooked Asian equities traders and gave them more reason to take profits ahead of today’s NFP release. Nikkei was down by 0.23%, Australia’s ASX closed 0.29% lower, and Hang Seng ended the day 0.42% in the red. What can we learn from the event? The good thing about Black Swan events like these is that there’s always something new to learn. First, we are reminded that trading during the early Asian session has illiquid pockets that exposes us to volatile price action. Next, we have to accept that the presence of algos will likely make volatile price actions like these a commonplace in the forex scene. All the more reason to place stop losses in your trades, don’t you think? Fundamentally, today’s crash also gives us a preview of how jittery investors are on the prospect of a “hard Brexit.” If Hollande’s tone is any indication, then it looks like the U.K. is indeed set to get the short end of the stick in the EU divorce. Unless officials like Mark Carney and Theresa May manage to reassure investors that Britain has some bargaining power against the EU members, then we’ll likely see more flight from U.K. assets in the next couple of weeks. How about you? Do you think that the pound is just having a bad day? Or are we looking at the future of the pound for the next couple of weeks?